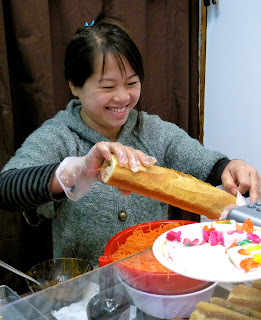 Anyone have recommendation for where to get Banh Mi (Vietnamese sandwich) in Paris. Daughter's craving one. Within minutes, I received a response from Richelle VHP with a link for the six best bánh mì according to L'Express. Deciding to start at the top of the list, we headed to Saigon Sandwich, a tiny hole-in-the-wall gem in the 11th arrondissement. As we watched the two women behind the counter stuff crispy baguettes with freshly grated carrots, thinly chopped cucumber and sprigs of cilantro, we deliberated between lemon chicken, pork or beef satay for the amazingly low price of 3-4 euros. Ten minutes later, we were shivering on a park bench savoring each mouthful of these unique sandwiches that are a delightful marriage of piquant Vietnamese flavors and French bread. Shortly after we had thrown away the empty bags from our bánh mì, I received the following tweet from Anne about a place in the 13th arrondissement. @OutInParisBlog If it's not too late: Thieng Heng on avenue d'Ivry right next to the main Tang Freres. As luck would have it, Thieng Heng is right next to the Chinese grocery store where I'm going to get some mangosteens for Sara's birthday treat in two weeks. I guess that I'll have to make a slight detour! One good thing then led to another. With frozen fingers from our bánh mì picnic, Sara and I were in dire need of a hot cup of something when Yelp (the app) came to the rescue with a recommendation for a nearby cafe just off the Canal St. Martin. It felt wonderful to claim the last two available spots - only recently vacated - in the tiny hip coffee shop, mysteriously named "Ten Belles". According to Sara, "Two Beaux" would have been more accurate given the two male baristas. Maybe the belles were in the back baking the delectable home-made mince pies, while the men skillfully prepared the best cappuccino that I've had in Paris. Oh, now we get the name... Please click here to see more photos of Ten Belles on facebook. Thanks for reminding me of something else we'll need to eat in Paris when we come in two weeks. My diet is already blown....x10. After living in Paris for four years, you must have a very long list of foods that you want to eat, Anne! I know that I would. But if you want to hold off on the bánh mì until you get back to DC, you could try Patricia's recommendation below. I'm sure that it's a good one. Would have loved to see the filling. What kind did you and Sara get (chicken, pork, meatballs, or a combination)? Oh, I love mangosteens too! Did you discover them during one of your sojourns in Southeast Asia? Next time you're back in the States, in Virginia, please make a stop at Nhu Lan in the Eden Center, on Wilson Blvd. Vous allez vous régaler! Does Saigon Sandwich offer a deal like "buy five, get one free"? Most places in the States do, and each bánh mì only costs about $3.50. Sorry that I didn't get a photo of the filling. We were in too much of a hurry to eat it! Both Sara and I had beef sate on our sandwichs. I'm not sure if that's an authentic Vietnamese filling but it was delicious. Thanks for the recommendation about where to get bánh mì when we're in Annapolis. I'll definitely try Nhu Lan. When I was there in August, Anne (who commented above) and I had Ethiopian food in DC. It was also delicious. Saigon Sandwich didn't offer us a "buy five, get one free" deal but they did offer us some hot tea. It made a good hand warmer since we ate our sandwiches outside. Mangosteens are going to be our Christmas treat! We used to eat them all the time when we lived in Asia. I miss tropical fruit - even durian! I see that Sara not only shares her Mother's love for food, but her skill with a camera as well!! The photo of the canal that Sara took with her phone put all of the photos that I took with my camera to shame. I think that I'll have to return with an expert photographer (eg. you!) who can give me some tips! I just googled "flat white" to see a photo and it looks exactly like the cappuccino that I had at Ten Belles. Here's what wikipedia says: A flat white is a coffee beverage originating from Australia and New Zealand. It is prepared by pouring microfoam (steamed milk from the bottom of a pitcher) over a single or double shot of espresso. The Australians (and probably the New Zealanders) and Americans have been in the forefront of the coffee revolution in Paris. Those cheeky Australians! When we lived in the tropics, I occasionally made Pavlova with tropical fruit for Sara's b'day cake. She was planning to have a chocolate cake this year but I'll have to ask if she would like a Pavlova from NZ instead. Thanks for the explanation about why it's called a "flat white". Less fluff is probably why I liked it so much. So how did Sara think the sandwich compared with those she gets at home? I am curious. And hungry. Sounds so good! And those two guys behind the coffee counter????? First things first - there's a picture of the two beaux in the photo album (Ten Belles) that I posted on facebook. The sandwich was delicious - a completely new taste sensation. Most unexpectedly, the Asian flavors work very well on a French baguette. And now I'm starting to get hungry.... Sara said that the sandwich was very close to the one that she had in NY and she definitely approved of the sauce. I always want a shopping pal...and a bánh mì eating pal would be even better! Vietnamese sandwiches have just surfaced in Chicago but I haven't checked them out yet; you've inspired me. Now just to get up to Lakeview. And how did I miss having a walk along Canal St Martin? I've only been up there once, it would have been great to see it again. And "Two Beaus" eye candy wouldn't hurt either. If we ever go to Ten Belles together, I promise that I'll let you have the seat facing the counter so that you can fully appreciate the eye candy. You'll have to let me know what you think of the Vietnamese sandwiches after you try one in Chicago. Oh dear, you've got a bit of spam there! Aren't daughters good at introducing us to new places? We used to frequent Tang Frères a lot at one time. It must be the best-stocked Asian supermarket in Paris! 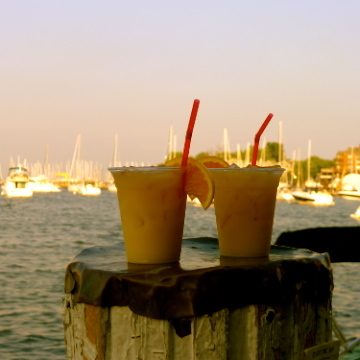 Having our adult children introduce us to new places has to be one of the biggest surprise benefits of having children. It's certainly not something that we foresaw when they were babies! I'm long overdue for a trip to Tang Frères and looking forward to it. As Lizzie and I are staying near both these places in January we can certainly check them out. Did you notice if they do vegetarian options? Nice to have Sara home for the holidays. Enjoy this precious time. There's a vegetarian bánh mì and Ten Belles had soup and salads on their lunch menu, so both places should be alright for Lizzie. Hi Anne! Good for you for stepping out of your comfort zone! I know what you mean about feeling a little bit nervous inside because that's exactly how I feel about some posts. Denise, the woman who commented above you, is a 60+ woman who lives in Bolton and recently started blogging. She also comes to Paris on a regular basis. After writing this post, I heard about some other cafes that I'm going to have to try in Paris. I'm also more of a cafe than a museum person. Btw Love Canal St Martin area .. I have friends that live near there too. The Canal St Martin area is lovely. I really do need to make a point of going there on a more regular basis. You're lucky to have friends there!